The Pancreas Diet is found in the book. The Pancreatic Oath by Candice Rosen, a registered nurse, social worker and health counselor. She says that this is not a diet book, or a book for diabetics but instead is a healthy eating lifestyle guide for everyone. In this book Rosen explains how eating the right foods can protect your pancreas and promote health, whereas when you eat unhealthy foods you are abusing your pancreas. By following the guidelines outlined in this program you will be able to discover the foods that help your pancreas function optimally so that you can easily lose weight. In The Pancreatic Oath readers learn about the connection between a healthy pancreas and long-term wellbeing. Rosen believes that “pancreatic abuse” is a major risk factor for the development of a number of chronic diseases – not just diabetes – including conditions such as heart disease, stroke, high blood pressure, kidney problems, and polycystic ovarian syndrome. The goal of the program is to reduce the workload on your pancreas by learning which foods keep your blood sugar in balance. This is achieved by monitoring your blood glucose levels four to six times each day after eating and recording the results in comparison with your food selections. The diet does not require any calorie or carbohydrate counting but it is necessary to eliminate all foods containing sugar as well as high glycemic carbohydrates like bread, potatoes, rice and pasta. Artificial sweeteners must be strictly avoided and alcohol intake should be limited or eliminated entirely. Fruit is permitted in moderate amounts, however, it must always be eaten alone (with two exceptions: apples with almond butter and Candice’s Super Smoothie). You should emphasize green vegetables and plant-based proteins such as tofu, tempeh and legumes, while limiting animal protein and avoiding dairy products. An eating pattern involving five hours between meals is recommended but in the beginning you may need snacks as your body and pancreas adjusts to a new way of eating. Dieters are advised to use a rather long list of nutritional supplements including multivitamins and minerals, coenzyme Q10 and fish oil. Rosen clearly explains the purpose of each of the recommended products and outlines how they work to improve your health. Salmon, shrimp, organic chicken, eggs, tofu, tempeh, beans, lentils, Vega protein powder, almond butter, tahini, walnuts, apples, pears, raspberries, lettuce, broccoli, cucumber, asparagus, cabbage, sweet potato, hummus, avocado, Grape Nuts, tortilla chips, pasta, quinoa, olive oil, cinnamon, herbal tea. Regular and moderate exercise is encouraged including walking, swimming, cycling, yoga, Pilates, and housework are recommended by this healthy pancreas diet. Dieters are warned not to do any strenuous exercise because this can cause a drop in your blood glucose that increases appetite. Rosen says that many of her clients are unable to exercise, but they are still able to lose two or three pounds a week on this plan. 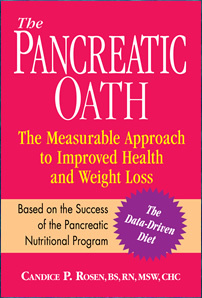 The Pancreatic Oath: The Measurable Approach to Improved Health and Weight Loss retails at $24.95. Does not require calorie or carbohydrate counting. Explains the hidden sources of sugar in the diet. Can help to prevent diabetes. Can be adapted to suit vegetarian, vegan and raw food diets. Encourages food journaling and daily weigh-ins, which have been associated with positive weight loss outcomes. Requires four to six self-administered blood glucose tests each day for the first eight to twelve weeks. Dieters may need to give up some of their favorite foods including sweets, bread, potatoes, coffee and alcohol. The diet involves a lot of rules regarding acceptable food combinations. The Pancreatic Oath is a program designed to help you discover which foods are bad for your pancreas as well as the foods that support balanced blood sugar. It requires daily self-administered blood glucose tests for the first eight to twelve weeks, which is correlated against your dietary intake to determine the foods that work best for you. Using this information you will create a customized diet plan that will support the long-term health of your pancreas, which can naturally assist you to achieve your ideal weight.